Obviously I adore a decent, lovely beverage for a gathering (which makes this one much all the more engaging.) 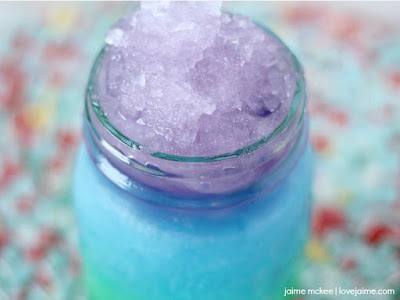 Also my birthday isn't that distant, and I figure I could go for mermaid slushies. While I'm very mindful my girl hasn't gotten into the mermaid stage, I sense it's coming. Furthermore, I can hardly wait to break out this formula with my children one day. Start by filling your blender about half way with green gatorade, sugar and 2 drops of green food coloring. Fill another 1/4 of the way with ice. Blend on high for about 1 minute. Pour into glass, filling 1/3 of the way, and place in freezer for about 10 minutes. While in the freezer, rinse blender and fill half way with blue gatorade, 1/4 of the way with ice, and 2 drops of blue food coloring. Pour into glass, filling another 1/3 of the way, and place back in freezer for 10 minutes. Do not freeze solid. Rinse blender again, repeat process with purple G2 gatorade, ice, and 1 drop of red food coloring, 1 drop of blue food coloring.